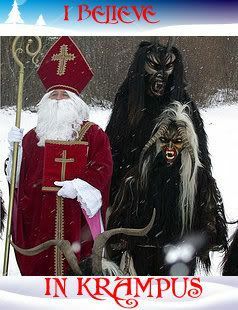 You know, I always liked Christmas but thought it could be more evil. Leave it to the Germans. 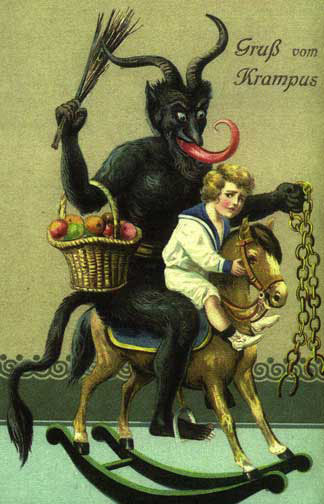 Krampus is an Alpine Christmas demon which accompanies St. Nicholas to punish bad children. Here is a song for him and my final video creation of the night. He used to come to my grandparents house with St Nikolaus on the 6th of Dec, St Nikolaus day, and ask if I had been good. Scared me half to death. I either hid in the bathroom, under the table, or under my grandmother’s apron. Broken toys and dolls were taken away in Nik’s sack, and then returned repaired before Christmas Eve when we handed out the presents which were hidden under a special lace tablecloth. The evil guy was dressed in black robes from head to toe, his face covered with a huge hood, his name was Hanes Muff, and he was a grumpy old thing. Sort of. I just wrote a comment in OT about the evil of the repubs. Santa has gone to feed his reindeer! 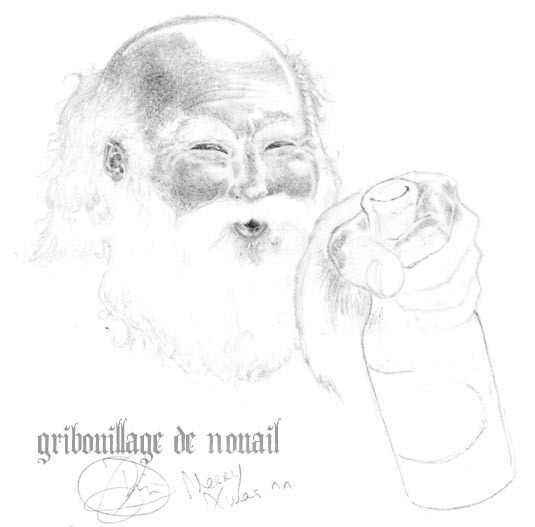 A 16th century villancico, Ríu Ríu Chíu, by Mirabilis. I didn’t spend much time on making this video. The Spanish pronunciation could be better, but it gives it some of its charm. The following are not mine, but follow along a similar vein. Considering the original music for this came from the 15th century, possibly much earlier, this interpretation has always moved me more than popular versions. Or, in the original Latin. I know it’s time to step away from the YouTube when I post this. See y’all later! Seriously though, would love to see that vid again after a few tokes. As long as your stash is mellow. Otherwise, it could be really freaky! Oh, how could I forget my namesake, Feliz Navidad? High of 28 C in Auckland. Kes, I love your sense of humor! Those fellas gave me a good chuckle. Silly is my favorite thing. They’re a bit “python-esque” at times, Cher. But great singers! Everyone have a great evening, time to go walk the dog before the sun sets, we will be decorating our tree tonight while blasting Christmas tunes, enjoy everyone! Peace and good cheer to all of you! Have a great evening, BDM! Always so good to see you here. Gonna be leaving shortly to take the Fave 4th Grader to The Glass Pavilion at the Art Museum for Friday night fun. Should be back in time for Vox Pop! I used to make Glogg every Christmas, but nobody liked it but me, so I was the only drunk one. YUM!